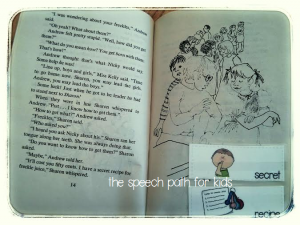 Is it possible to incorporate chapter books into speech/language therapy? I have had this on my mind for a long time. 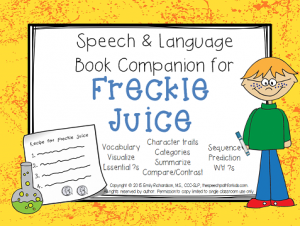 Chapter books are rich with opportunities to teach vocabulary, language concepts, figurative language expressions, and conversation topics. 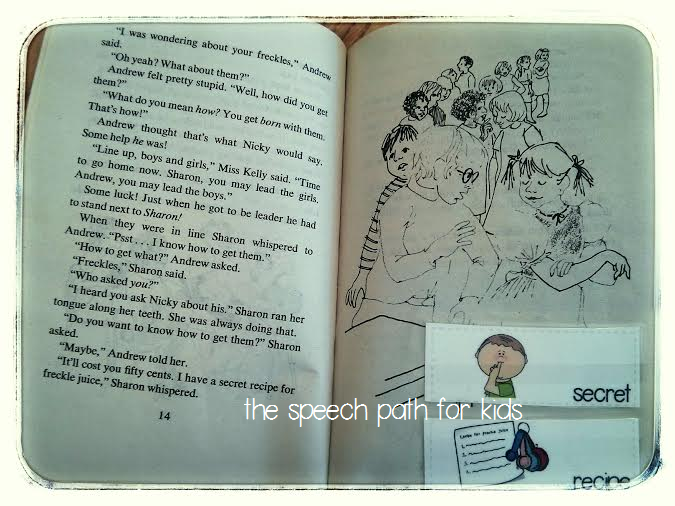 They often have quirky characters that go on exciting adventures and I’d love to take my speech/language kiddos on that journey. But my time with students is short and chapter books are long. They are full of, well…chapters! 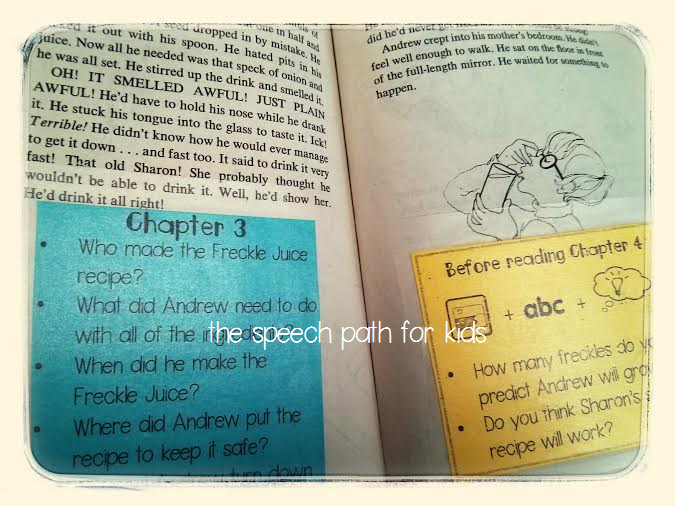 I have attached vocabulary, predictions, and comprehension questions directly to the pages of my book. This will free up my space so that I don’t have all sorts of materials and visuals floating around. Plus, it makes sure the questions are right there for us! 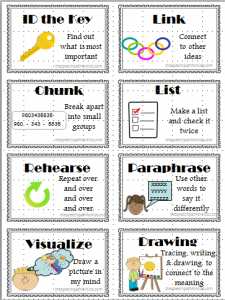 When it comes to teaching vocabulary, I have found great success with using the memory strategies of “ID the Key”, “linking”, and “rehearsal”. You can read more about how I incorporate these strategies and also download the F.R.E.E. visual cues. 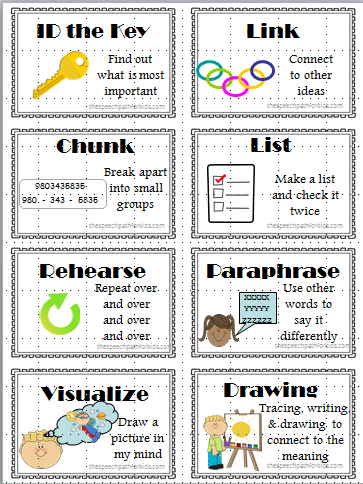 To teach the vocabulary, I focus on descriptions, examples, and synonyms to teach them how to define. 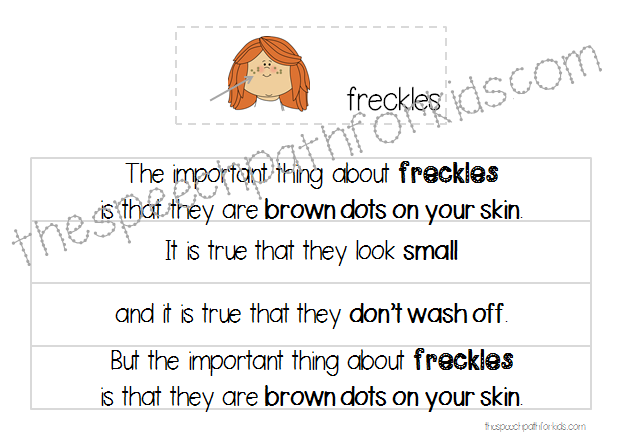 Each time I introduce a new vocabulary word I use a familiar and repetitive structure of “the important thing about…”. The structure starts out with the most important aspect (if they can only remember one thing about the word, this would be it), then has two supporting details, and ends with a repetition of the most important trait. My students have really responded to this structure for learning vocabulary. We then make connections to self with short written responses. As far as how I will organize my lessons, I plan to teach the vocabulary throughout (about 3 new words per chapter). There are a few words that resurface throughout the story so we will have opportunities to rehearse in a natural context. 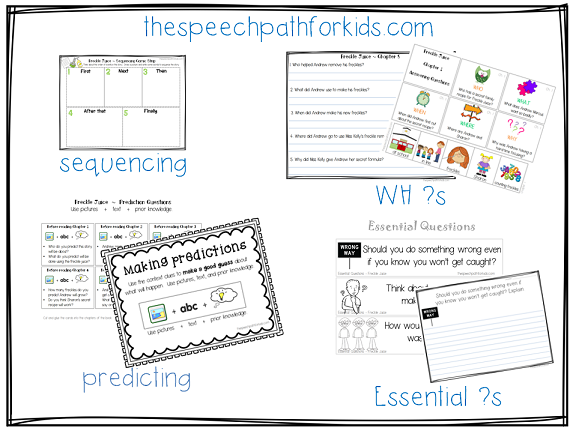 The prediction questions and comprehension questions are also set up to do as we are reading. I’ll teach visualization and categories about midway through. Character traits can be discussed around chapter 4. 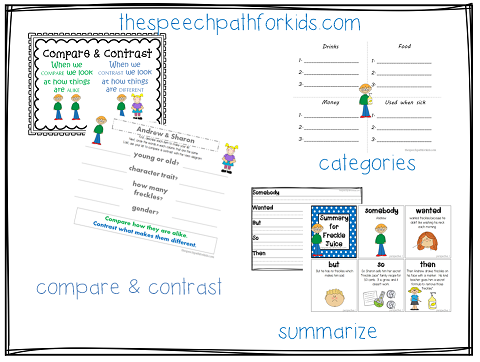 The skills of summarizing, sequencing, and compare/contrast will be addressed at the end. I will preface the lesson with exposure to the essential questions…I am interested to hear the answers prior to the story and then again after completing the unit. I put my visuals in a binder and clip it to a desktop pocket chart stand. 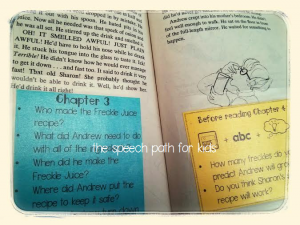 The comprehension questions are in several formats. There are 5 per chapter (one for each type of WH- ?). I have a question board with a visual cue for the type of WH- ? as well as answer choices. (You can cover the choices unless you absolutely need them). I also have these same questions (without the visuals) on small cards to tape into the book following each chapter. 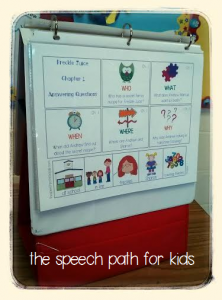 I’ve organized my question boards, mini anchor charts, vocabulary pages, and other visuals into a binder. 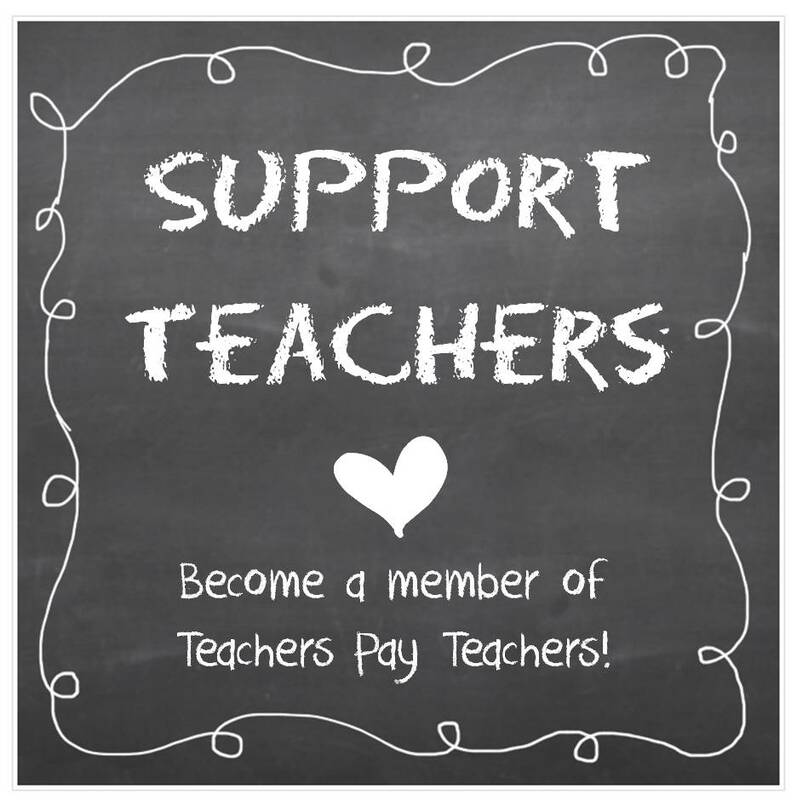 This gets propped over a small pocket chart/card stand that I have for each access during the lesson. (If don’t have one of these stands you could use the Super Duper tri-fold mirror or a 2-3 inch binder as the base) It is portable and visual making it a friendly accessory! It so important for students to have opportunities to learn and practice the skill, not just be quizzed on it. 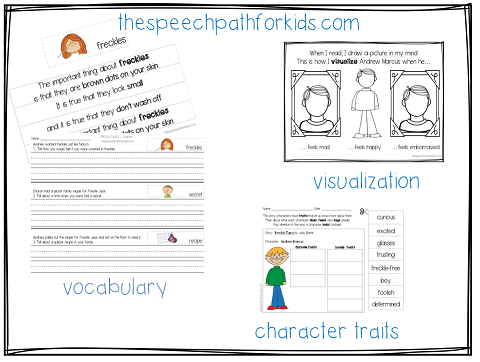 In order for my kiddos to access many of these skills, they need to draw, write, speak, listen, move, sort, and act. It also must be relevant, interesting, and meaningful. 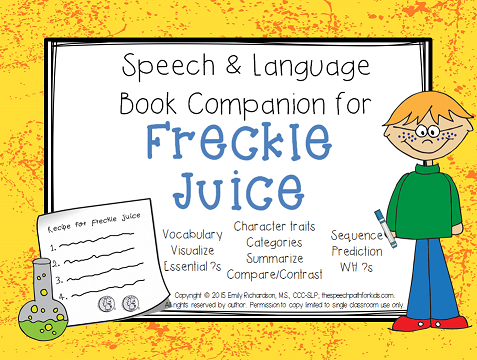 I look forward to sharing my experiences as I explore Freckle Juice in speech therapy!